Manufacturer of a wide range of products which include parking protection products and park sentry. Parking protection products are ideal for any column including concrete columns as well as any rack or corner pole. These protection products are available in a variety of sizes to fit most columns including concrete columns as well as corner pole. Parking Protection products adds a soft, scratch-resistant layer of protection around concrete columns, protecting both columns and vehicles from collision damage. Increase the visibility of the column to avoid collisions. With these products installed, vehicles can confidently park closer to the columns, virtually expanding the usable parking space. It is made of a bright yellow EVA material that adds visibility to the area. Its unique design offers extra protection in the 90 degree corners where most collision damage occurs. It can be customized to fit any square or rectangular concrete column. Parking protection Products are ideal for car-park applications because it maximizes protection without sacrificing parking space. 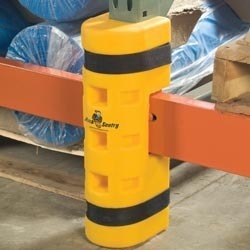 Rack Sentry® rack protectors attach to your rack uprights, protecting them from the abuse from collisions with forklifts. Constructed of a flexible EVA material, Rack Sentry gives your racks a highly visible layer of protection that's easily installed without tools. Rack Sentry is available in a number of sizes to fit most uprights. Additionally, there are models available for low beam installations and for end racks. Rack Sentry® is ideal for intermediate rack uprights where high visibility and a flexible layer of protection is most needed. The product is designed to absorb impact by flexing, returning to shape to work again. We have tested Rack Sentry® to a limit of 3mph (5km/h) using a 5,000 lb. (capacity) forklift without visible damage to the rack upright, forklift, or product. Rack Sentry® installs directly to the rack upright, eliminating the need to drill into the floor at the rack upright. In use, Rack Sentry® puts no stress on the floor. Park Protection is a new, attractive way to add a layer of effective protection around parking structure columns. Adds a soft, scratch-resistant layer of protection around concrete columns, protecting both columns and vehicles from collision damage. Easily applied with few or no tools, increases the visibility of the column to help avoid collisions altogether. With Park Protection installed, vehicles can confidently park closer to the columns, virtually expanding the usable parking space. Moulded from a thin layer of specifically engineered ARPRO® material, buffers the column with scratch-free padding. Unique design offers extra protection in the 90 degree corners where most collision damage occurs. It can be customized to fit any square or rectangular concrete column. Ideal for car-park applications because it maximizes protection without sacrificing parking space. And also covers the “splash zone” preventing column corrosion from road salts and debris. 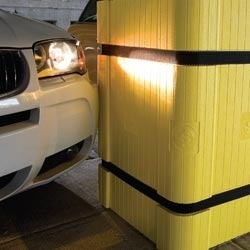 Looking for Parking Protection Products Main ?